has such a great happy feel to it...The Tropical tunes can turn any situation into a warm one!" Together we're making the Day Brighter...One song at a time! We are so Happy you are here. 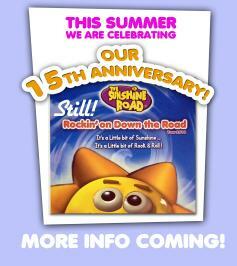 For over fifteen years The Sunshine Road Show has been committed to bringing the highest quality entertainment to families, children and their caregivers. We pride ourselves on our creativity and we cherish the friends we have made along the road. We have a lot of new things planned for 2015. And remember...this is the place to find great New Music and Smiles for you and your Family. Look for Sunshine Road downloads on itunes, yahoo music, aol music, rhapsody, target.com, and many other fine retailers. 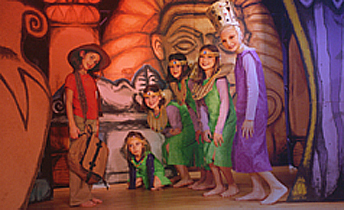 W I N N E R.
The Sunshine Road Show is an Award-Winning Musical Program. 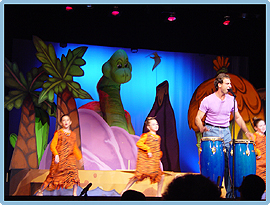 It has been performed at a variety of venues, including Sesame Place, Lake Compounce, Six Flags Amusement Park, The Hartford Civic Center, The Brooklyn Children's Museum, The Pilot Pen Tennis Tournament, Give Kids the World Theme Park, Orlando Florida, Radio Disney's "First Noon" Celebration in Tampa and many others. The Show was featured on The Best of Connecticut by NBC Channel 30 and received honorable mention in the international John Lennon Songwriting Contest. 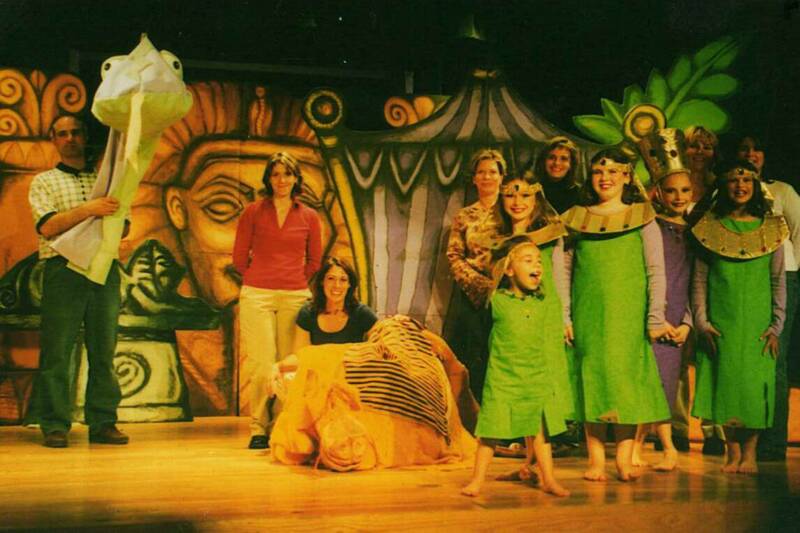 Touring for over fifteen years, the Sunshine Road team believes in the power that music has on children's well being, which is why they have devoted their creativity to developing music that is encouraging, interactive, and of course fun! Thank you to all who have helped make this dream possible for all their great work and support. Special thanks to Rhonda and Tim Mesenbourg for all their support and Inspiration. "We are humbly thankful for the opportunity to serve families with our songs and we hope they will continue to bring joy for many years to come". 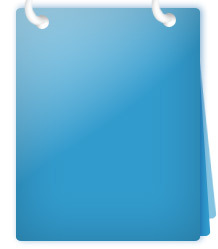 Church Organizations, Company Picnics, Festivals, etc. Elementary Schools , Camps, etc. Libraries, Book Retailers, Parent Groups, etc. * available for small groups only. call first. situation into a warm one!" 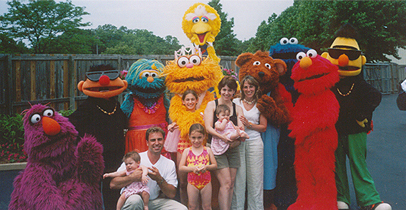 With the "Sesame Street" gang for Shows at Sesame Place. 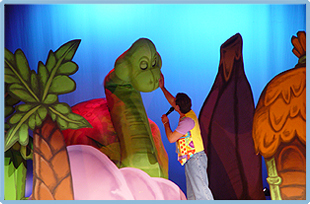 On the Stage of the "Great Mummy Mystery Show"
At Lake Compounce to make a music video for "Blue Blue Water". -Paula sending out the tubes-all the kids having a great time -awesome! Rhonda Rockin with the crowd for a warm Labor day weekend Show in the water park. The Sunshine Road goes to Dinosaur Island Show- greetings from Darby the Dinosaur! The Sunshine Road Music is designed to be uplifting and refreshing. refered as "A little bit of Sunshine and a little bit of Rock and Roll." July 2018 Bristol Library for a rockin Summer Show. New Songs coming this Summer! year at the Harwinton Fair!! Still Rockin' on down the Road!